Here in the US Midwest, the weather is really heating up. Definitely not good for shipping chocolate. For some reason, this has me in the mood to post chocolate reviews, so why not another KitKat? Variations on strawberry must be popular flavors for Nestle, as they keep bringing them back. Strawberry Tarte is one such variation. 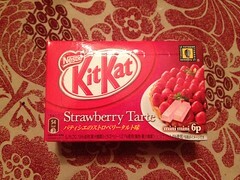 It's not the most exciting flavor of KitKat; Nestle's not fooling anyone by throwing the word "tarte" on the end - it's a strawberry KitKat. But not every flavor can be special. The bar smelled sweet and buttery (that must be the tarte part), and just a bit floral. The strawberry flavor was pretty fake and had a buttery finish. The white chocolate felt cool on the tongue, which was a bit odd with the strawberry. It wasn't bad, but I couldn't really call it good, either. 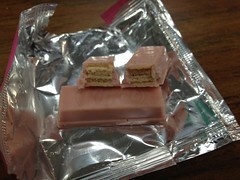 The bar had a sweet, almost cloying aftertaste, which is typical for this sort of KitKat. Nothing special. But if all KitKats were special, none of them would be.